After the Cambridge Analytica scandal, Facebook made the headlines again, the company collected users’ Android call and SMS metadata for years. The Cambridge Analytica case it raised the discussion about the power of social networks and the possibility of their abuse for the conditioning of political activities. The non-professionals have discovered how important their digital experience is and how companies specialized in data analysis operate without their knowledge. Social network platforms have an impressive quantity of information about and are able not only to profile us but also to influence our choice. Six years ago I was banned by the “democratic” Wikipedia because I coined a term that described how it is possible to manipulate social network, the voice “Social network poisoning,” was deleted by Wikipedia English but it is still present in Wikipedia Italian version. Back to the present, many of you probably still don’t know that if you have installed Facebook Messenger app on your Android device, there are chances that the social network giant had been collecting your data (the start time for each call, the duration, and the contact’s name), including contacts, SMS data but not the text, and call history data at least until late last year. The Facebook Messenger app logged phone call data only related to numbers saved in the phone’s address book. Facebook was collecting such kind of data, this is not a surprise for tech-savvy people because we have discussed it in the past. In January, the popular Italian expert Simone Margaritelli wrote a blog post (Italian) on Medium inviting users to uninstall Facebook and Whatsapp. The programmer Dylan McKay was able to find data, including logs of calls and SMS messages, in an archive he downloaded (as a ZIP file) from Facebook. Mat Johnson, a Professor at the University of Houston Creative Writing Program, also made the same disturbing discovery. The Cambridge Analytica case has is giving users another point of view regarding the collection of such kind of data made by Facebook and the real way they are using for. A Facebook spokesperson explained that the platform collects this data to improve the users’ experience. “This [above] screen in the Messenger application offers to conveniently track all your calls and messages. But Facebook was already doing this surreptitiously on some Android devices until October 2017, exploiting the way an older Android API handled permissions.” wrote Sean Gallagher, Ars Technica’s IT and National Security Editor. Facebook denied to collect call data surreptitiously with an official blog post, the social network giant highlighted that it never commercialized the data and that users are in total control of the data uploaded to the platform. Users can check data collected by Facebook going to your Facebook Settings→Download a copy of your Facebook data→Start My Archive. “Call and text history logging is part of an opt-in feature for people using Messenger or Facebook Lite on Android. This helps you find and stay connected with the people you care about, and provide you with a better experience across Facebook. People have to expressly agree to use this feature. 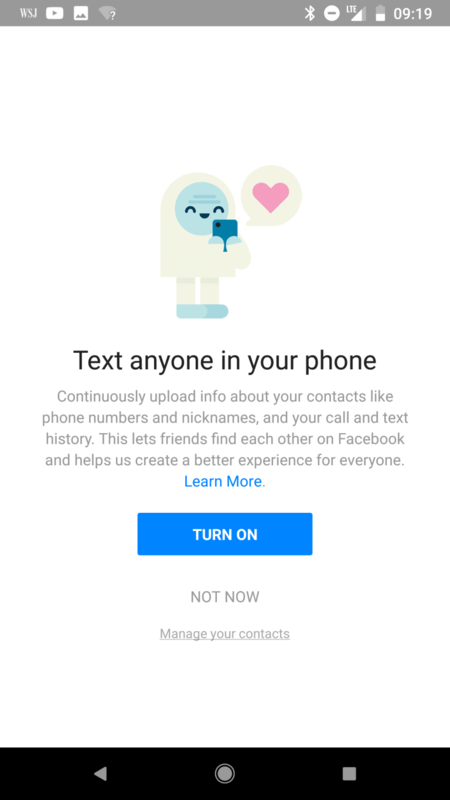 If, at any time, they no longer wish to use this feature they can turn it off in settings, or here for Facebook Lite users, and all previously shared call and text history shared via that app is deleted. While we receive certain permissions from Android, uploading this information has always been opt-in only.” continues Facebook. If you want to stop Facebook from continuously upload your contacts to its server, you can turn off the uploading feature in the Messenger app. In this way, all previously uploaded contacts will be deleted. iOS users are not affected by this issue. Lesson leaned … every time we use an app it is essential to carefully read the documentation that details its work. ← Do you have what it takes to withstand modern DDoS attacks?